A little light-heartedness in a grey season: more of the lares and penates in our neighborhood. although without the aid of most of the roads shown here. Google Maps. Among the missing information for the Kladas revolt of 9 October 1480 is the size of the revolt. A variety of numbers has been put forth -- a recent Mani writer claims 16,000 rebels -- but with a little combing we can come up with some reasonable numbers. With a little more combing, we can come up with the names of probable participants in the rebellion -- one man does not make a rebellion even if he is a Greek. In 1867, Konstantinos Sathas wrote that 1600 revolted with Kladas. (Going through his sources, I have not been able to find where he got that number.) The Venetian report said that Kladas had his company and 16 more in the revolt. A year earlier, he had a company of 150 men. If they all joined him, and the 16, that would make 166. You can see a certain resemblance between that number and 1600 and 16,000. The epenthetic zero is an important factor in sorting through Greek history, as I wrote a year ago in discussing the propensity to cite 6000 as the number of fighting men in the Morea. Since there was a peace settlement with the Turks, Venice had decided to disband most of the stratioti companies, but asthe officials in charge of that arrived in Koroni a couple of months after the revolt, it is quite possible that about 150 stratioti accompanied Kladas. That was a substantial group, and quite enough to cause serious alarm, especially as Kladas was flying the flag of S. Marco with its red field and golden lion. Normal riding -- I am told this by horse people who have looked at the map and the mountains -- would have taken them about six hours from Koroni to Kalamata, and possibly as much as twelve more to Kardamyli. The 9th of October was the night of the full moon. Mani writers tend to claim that the company rode out of Koroni on the night of the full moon, without considering that Koroni could not have held so many horses within its walls, or that gates of Venetian cities in the stato da mar were locked at night. The full moon comes into the report because -- as the Senato did in Venice, and the Sultan in Constantinople -- people may not have calendars but they nearly always know when the full moon is. Reports of the revolt make it clear that Kladas had supporters in Mani who joined the revolt: the full moon let them know when to be prepared. About the other 16: Kladas revolted, or led a revolt, because the peace settlement after the war assigned Mani to the Ottomans, and thus the Kladas lands of Elos and Vordounia were taken away from them. Thomas Kladas, lost his villages of Ardovisca, Prasto, and Milea, granted in recognition of the services of his father who was killed fighting the Turks. Matheus Rallis Melithi lost the mills at Mantinea granted in an argyrobull from the Despots. Michali Rallis Drimi lost four villages. Perigrino Busichi, his brothers Silo and Zorzi, and his nephews Petro and Zorzi, lost the villages they had inherited, as did the brothers Petro Lisi, Lazaros Ingrala, and Micha. Capo Zorzi, Yannis, and Niko Menaia, brothers related to Petro Bua, lost lands and casalia acquired by inheritance and marriage, and the authority of a document from the despots sealed with a silver seal. Nikolaos and Demetrios Bochalis (whose kinsman had been tortured to death for aiding the Venetians), Nikos Pagomenos and his brother, and Michele Pagino lost lands. Philippo Sofopulo lost Casale and Catafigo. The fragments of information about these lands suggests that some of them had been assigned within the Byzantine system of small pronoias, grants to soldiers in return for service. The holders were then entitled to taxes, services, gifts, and grain from the households within the pronoia, in addition to rights over mills, fish ponds, and salt pans. Plotting these locations on a map reveals a dense network of small villages and holding: few of these men would have been considered wealthy, even then. Their incomes and homes were lost, and with peace, most of them lost their real occupation. There are twenty names here in addition to Kladas, all of them likely participants in the revolt. The twenty names do not appear in accounts of the revolt, or in lists of those pardoned, but they had all earlier received assurance about their lands from Venice, and now the lands had evaporated. The uprising soon took Mantegna belonging to Nicolò Mezan, Megalo, Maino, and then the towers of Castagna, Gastiza, Lestini, and Ardovisca, and Prasto belonging to Thomas Kladas, la Piaza, and the Casale and Catafigo of Philippo Sofopoulos. Or to put it another way, the former holders of these territories took them back. Or, the residents, slightly bewildered, joined up with the armed men who appeared with the flag of S. Marco. Since a number of casali joined in rebellion, it is likely that with Mezan and Sofopoulos we have two additional names of men who joined the rebellion. Trigafoli and Oitylo were also taken, or they also joined the Kladas event. Oitylo is more than half-way down the western coast. 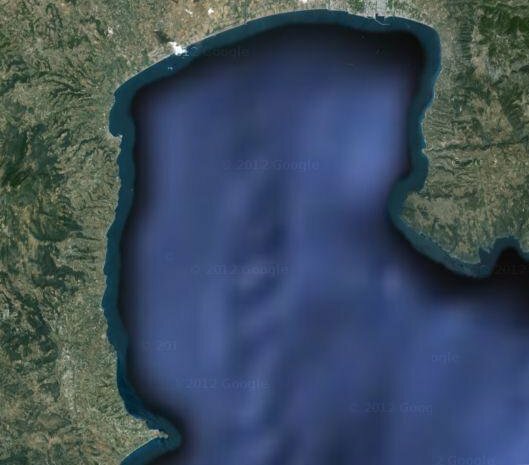 From Koroni to Oitylo is about 120 kilometers or 75 miles: the rebels covered a great deal of territory without opposition. The numbers, of course, will have varied from time to time, and once it was known in April that Kladas had escaped on a Neapolitan ship, after a battle in which 700 were said to have been killed (all through the century, 700 and 800 are the regular numbers for people killed by Turks -- Negroponte, Davia, Otranto, Methoni), the number of rebels would have melted like a spring snow. Bartolomeo Minio, who was instrumental in obtaining a pardon for the rebels (I wrote about this two years ago), said that there were 77 Kladioti at that point. When the first pardon came in, it listed 17 names: it took a while to get the names vetted, and by that time most of them had become bandits. lower left, to Kardamyli., cape on the right. Google Maps. For more detail, see the draft first chapter of my forthcoming book, The Knight and Death: The Kladas Affair and the Fifteenth-Century Morea. The paroikoi -- serfs -- on all those church lands, and most of the other land in the Morea, were obligated to the landholder for a certain number of days of work (ἀγγαρεῖαι, angarias) each year, in addition to assorted taxes and percentages of produce -- oil, grain, wine. There is no information about angarias in the Byzantine Morea, and very little for the small Venetian territories, but there are indications that the obligations were similar. One writer has found variations of 12, 24, and 52 annual days of labor in other parts of the late empire. Where angarias are mentioned, the details are usually taken for granted, but obligations included gathering straw for the governor's horses and firewood for the governor's residence, a contribution of five pounds of wax annually, repair work on fortification walls or the roads, rowing on the local galley, and guard duty. In extraordinary circumstances military duty was an angaria, such as the time Bartolomeo Minio called up all the men in Nauplion territory and supplied them with weapons in anticipation of an Ottoman attack. (This was during the harvest season, when meant that the next year's tax revenues were lower because of crop losses.) At another exceptional time Minio needed an angaria of the paroikoi, their boats, and their mules for an elaborate construction project for the lower city walls which required bringing in lime for mortar, and boat-bridges so work could be done from the water side. He wrote, "And I myself worked with them." The Naupliots remembered this, and it was recorded in a chronicle that Minio had built the lower city and had worked in person with the Greeks. During the first half of the fifteenth century, we can see the Venetian cities shifting from day-labor to cash angarias, and at times suppressing them because of labor disappearing from the territory. In 1414 Koroni changed the angaria owed from one day a week, to one day a month, supplying the paroikoi a guard against the Turks when they went out to get lime for construction, but in 1439, because of losses to plague new angarias were imposed. Angarias in Methoni and Koroni (which sometimes differed from each other) differed somewhat from those in Nauplion-Argos, and from those among the Venetian island holdings and there were attempts at rationalization. Special groups, especially much-needed new settlers, might be exempted for a period -- new settlers in Argos in the late 1390s were to be free of angarias for five years and were given their land -- and in one case Tinos and Mykonos were exempted from all angarias because the islands were so much more fertile than expected. Sometimes paroikoi could get away with non-performance of their angarias. In 1456 Methoni was trying to demand angarias from their paroikoi, a situation that had apparently been been going on for twenty years. But then, there were so many raids from the Despotate on the paroikoi and their farms that the area had become depopulated, and Methoni was always on the edge of a food crisis. Over and over, paroikoi in Venetian territories made demands for lighter angarias, and Venice often made pragmatic arrangements, such as requiring day-labor or the loan of farm animals, but not both at the same time, or, a requirement for less straw since one governor had fewer horses than the previous. Nauplion allowed paroikoi to make use of the town boat to bring in required firewood, but when they protested having to carry the wood up to Akro-Nauplion from the port on foot and asked to be able to borrow animals, they were told to continue the way they had been doing it. The surviving documents that record the lands in the Morea held by Nicholas Acciaiuoli (d. 1365) and his family give a dense view of the paroikoi and their obligations. The Acciaiuoli had allegiance to the court of Naples, and it is not easy to know the extent to which these represent Neopolitan custom or if they are consonant with Byzantine. I think one has to assume there is not too much difference from the Byzantine, if only because paroikoi could always disappear and go to another rule. What comes immediately clear is that a great many of the obligations were paid in cash, meaning that the paroikoi had not only the burden of labor, but of marketing their produce for coin. The Morea is notoriously short of coin finds in the archaeological record for the medieval period, and the lists of obligations suggests that they used a mixture of coins: the ones mentioned here are hyperpera (more likely to have been an accounting value rather than a coin) and sterlings, or deniers. (I have a sterling, a small silver coin of the period, from Apulia.) Other coins are Frankish tornesi and Venetian soldini. In that list of 26 names -- most names came with a family -- each family unit was obligated for 5 hyperpera annually as angaria, and on another list, some were obligated for 2 1/2 hyperpera. I do not know what 2 1/2 or 5 hyperpera would have meant in real life, in purchase terms, but occasionally an alternative is shown, so that when someone owes 2 pounds of wax,1 the value is shown as 10 sterlings, 3 pounds of wax are 15 sterlings, and 5 pounds are 1 1/2 hyperpera. Another who owes 6 pounds is given the same equivalent of 1 1/2 hyperpera. 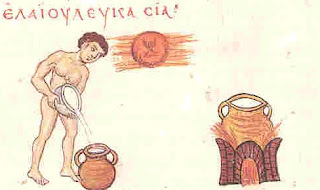 Johannes de Bon owes, annually, one container for wax, at a value of 15 sterlings, while Stephanos Mavros owes for his garden in Andravida a wax containter to the value of 4 sterlings: others just owe wax containers, no value specified. 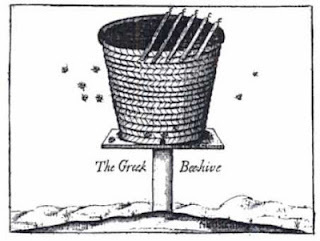 We do not know the form of bee hive. A print from the late 17th century offers a different model from the manuscript picture above. * Demetrios Kobotos -_ 1 hyperper, 12 1/2 sterlings, 1 chicken & 10 eggs. * Georgio de Blasio -- 1 1/2 hyperpera, 1 chicken & 30 eggs. * Johannes Romaza - 1 hyperper, 1 pound wax, 3 chickens & 100 eggs. Constanta Pellekanos and Nikolaos Anastasopoulos were also obligated for chickens and 100 eggs each. Other individuals owed 40 eggs, or 76, and quite a few owe 10 pigeons. Zacconi (a Tzakonian?) was an archer and so was obligated to serve with his arms. Much more could be said about these Acciaiuoli documents. There will be another entry later. 1Observation of our own beehive demonstrated that one large beehive produces five pounds of wax a year. A series of chrysobulls from Andronikos II in 1314-20 -- painted on the walls of the Brontocheion at Mistra, when the Byzantines held perhaps a third of their final territory -- itemize the monastery's properties that extended from Mouchli to Mistra (Μυζηθρἀ), and from Elos to Androusa. These were to be under the control of the protosynkellos1 of the Peloponnesos, a Kyr Pachomios. These properties were a jumble of monastic estates, small parcels of land, wells, trees, and villages, often identified by the name of a local church or monastery, or as being between two rivers, or at the place called the "Two-Eyed Mill." 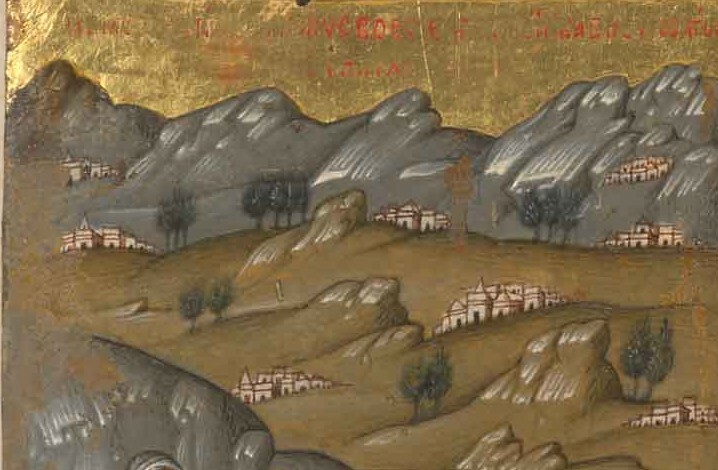 The descriptions give a sense of what you would see if you were traveling through the Byzantine countryside. There is a zevgolatio2 at the river Brysioto; 150 modia of land in various places near with vineyards, olive trees, other fruit trees; paroikoi3 near Mistra at the Two-Eyed Mill; an uncultivated parcel near Philito; four paroikoi at Delvina; the well of Ag. Demetrios; the metochion4 of the Apostle and Evangelist John the Theologian with its paroikoi, vineyard, fields, olive and fruit trees, and mills; another metochion, of the Theotokos, with its paroikoi and fields and the right of justice, with the irrigation channel from the river with the bridge; uncultivated land at Mitatova; the metochion of Ag. 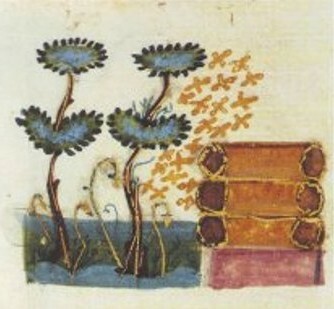 Basil at Elos with its paroikoi and fields, and mills; the metochion of the Ai Theodori at Mouchli with its paroikoi, fields, and mills. The list goes on and on, leaving the impression of an intricate mosaic of villages and fields and paroikoi being handed about to different owners like chess pieces. The monasteries acquired their territories in bits and pieces, as when Leon Kladas gave the Brontocheion a vineyard at near-by Trype, and several Akrokondyloi gave their fields at Terkova. Sometimes it was a large piece, as when Manuel II gave the church of Monemvasia the lands of Helikovouno to finance perpetual weekly masses for his dead children. Speaking of Monemvasia. In 1293 and 1301, the generous Andronikos II confirmed a broad jurisdiction to the church of Monemvasia which was to extend in a belt across the Morea, into Mani, and far as Pylos (which is also called Avarino). That this territory was primarily under Venetian and Frankish control was of little concern: some day it would be Byzantine. Monemvasia was to have possession and rights of justice over the villages of Nomia, Taireia, Mountousa, Sios, Kampos, Episkopeia, Philodendron, Kamara, Ripiai, Kalamios, Dikasteria with their fields, trees, vineyards, and paroikoi, and also several villages in Elos with four watermills and vineyards, and Nodun on the shore with a tower and palaiokastro. The church was also given possession of the monasteries of Ag. 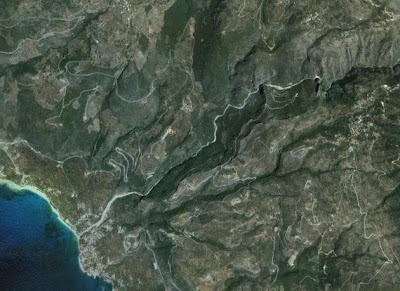 Georgios and Prinikos with a whole share of the oak-trees, not just half as before, and churches at Soraka, Koulendian, Koumaraia, Voulkani, and Dodaia. It was also to receive the value of 25 hyperpera (at the time a coin of 12 carats of gold) from the village of Polli Ksenoi. In the early 15th-century, George Gemistos Plethon noted that the church had possession of more than one-third of the land in the Morea. This is one-third of the land and its inhabitants removed from a centralized legal and judicial system -- however weak it may have been -- and at least one-third of the tax revenues diverted from any possibility of public spending into a closed system. No one did more than Andronikos to guarantee the failure of centralized Byzantine authority in the Morea. 1 Protosynkellos = primary administrative assistant for a bishop. 2 Zevgolatio = area of land large enough to require two oxen for plowing; under the Turks, a ҫiftlik. 3 Paroikoi = Greek "serfs" tied to the land. 4 Metochion = monastic property. 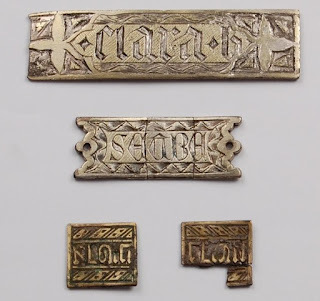 Lombard and Hebrew plaques from the Halkis Treasure. Some of the items are demonstrably from Halkis. 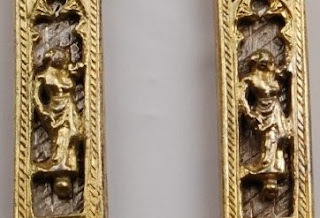 The first picture shows two small ornamental plaques with Lombard lettering. One says CLARA. B. and the other says SEABA --probably another name. Halkis -- Negroponte -- was given to the Lombards in 1204 as part of the division of territory after the Fourth Crusade, and it was Lombard Dominicans who built Ag. Pareskevi in the 1260s, as the style of sculpture on the triumphal arch demonstrates. The Hebrew plaques are tiny, not 2 centimetres long. The first transliterates as ARTINO which seems to be meaningless, as are the other Hebrew plaque inscriptions. Halkis, with Thebes, is of course known to have had Jewish communities from very early. 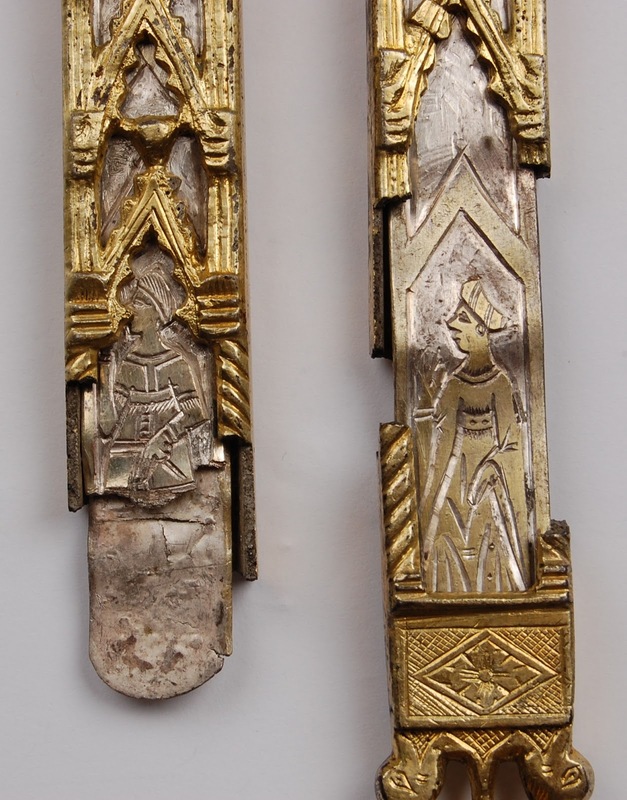 There is no reason to question whether the specifically Venetian items in the Halkis treasure were found locally, although there is no reason to assume that they necessarily were. There was a Venetian presence in Halkis from before the 1082 chrysobull of Alexios Komnenos until 1470, and Venice acquired complete control of the island in the 1380s. With these belt ends, we move into questionable territory. 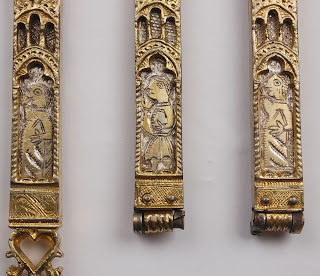 They are in the late 14th-15th-century Gothic style, particularly of northern and eastern Italy, and they could have been found anywhere Italians lived in Greece. Or anywhere Italians lived. These belt ends are appealing pieces, with their clumsy craftsmanship and the serious interest in architectural forms. These all seem to be from the same workshop,even possibly the same craftsman. Possibly you could have the figure of your choice inserted into a pre-fabricated set of arches. Were they found together? We don’t know. Here is a belt in use. A great many of the items in the Halkis collection in the British Museum are the small metal belt appliques such as you see on this belt and below. Lampros offered Fortnum more than 200 buttons -- mostly silver and silver-gilt -- which went on to Franks for his collection. 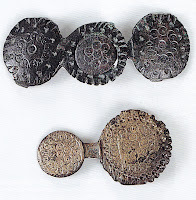 In the British Museum catalog, each button has its own entry, which gives us 60 entries of one style of button, 40 for another style, and 42 for another. Buttons could have been found anywhere. Notice here that this wonderful spherical gold and pearl button has threads from a fabric still attached. Some pieces strike me as highly unlikely to have been found in Negroponte/Halkis. 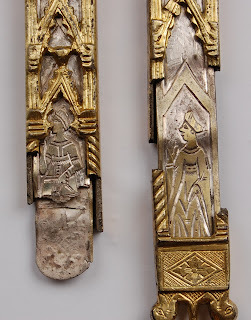 These belt ends -- three were found -- with the clumsy three-dimensional classical figures under Gothic arches fascinate me. Where was a gold-worker seeing classical or Hellenistic sculpture? If you consider that the Florentines held Athens for seventy years, lived on the Acropolis, and had the Parthenon sculptures before their eyes, I think it a reasonable guess that these pieces were made, if not found, in Athens. I have already written about the three Malatesta stemme -- coats-of-arms -- in the Treasure. The Malatesta were based at Rimini and Pesaro. This was a large family of condottieri, and there is no indication that any were involved in trade. Possibly one led fanti in Negroponte, but if so, no records have survived. But there were Malatesta in the Morea, which is a much more likely source for these finds. Pandolfo Malatesta was Archbishop of Patras from 1424 to 1430, and his sister, Cleofe, was married to Theodoros II Palaiologos at Mistra from 1421 to 1433. When you have enjoyed the world then you come to the tomb, Gold comes from the Clay, Flesh from dust, I have experienced both." A ring in the Franks Bequest -- not identified as part of the Halkis Treasure -- may offer a clue. It is shown in the Metropolitan Museum of Art catalog of the Byzantium: Faith and Power exhibition of 2004 which identifies it as coming from Mistra, as does this ring in the Mistra museum which was found in the sea off Monemvasia. 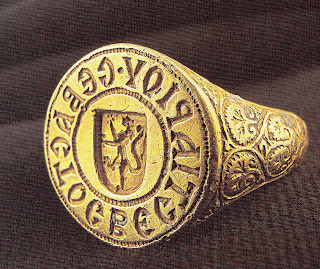 Gold ring, Mistra, with Lusignan emblem. These are the sort of things we would hope to find -- expect to find -- at Mistra, along with many of the other items at least of the quality of the Halkis Treasure. But with very few exceptions -- the gold ring, a few earrings -- these items below show what has survived to be exhibited in the Mistra museum -- low-quality metal, clumsy craftsmanship. 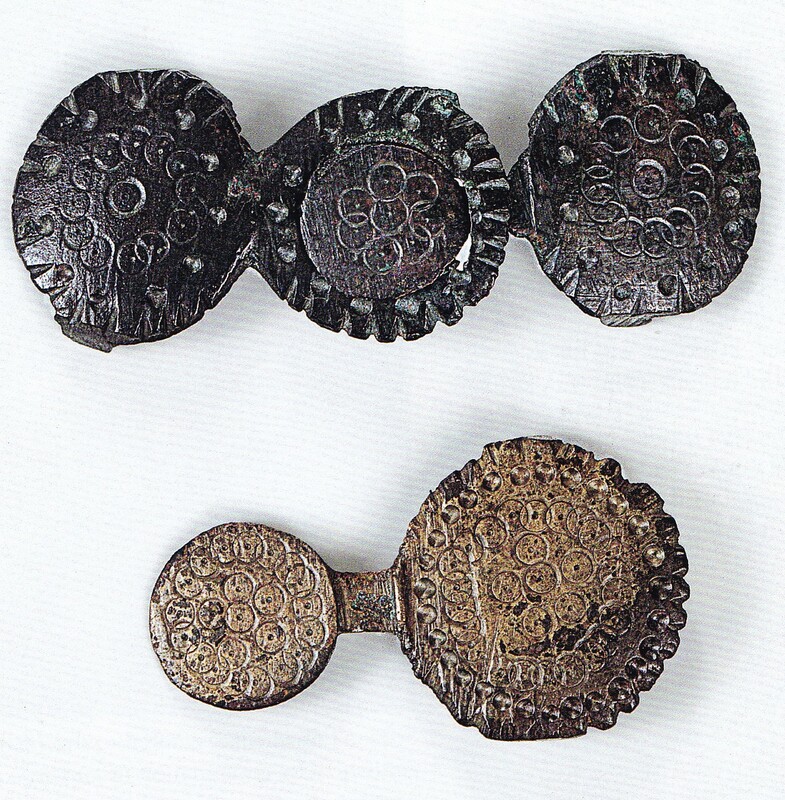 But perhaps these were the items that were left for archaeologists after the pearl rings and the gilt buttons were selected out. Finds in the Mistra museum. Lampros had an "agent" in Negroponte. He certainly had an agent in Corfu, which was his home. In this group of 14 letters he mentions being sent items from agents on Kalymnos, Nissiros, Melos, and in the Peloponnesos. 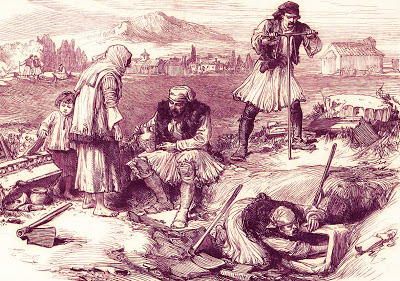 Grave-robbers, Isthmus of Corinth, 1877. This picture, from a London Illustrated News of 1877 shows people -- who might be called agents -- at work at the Isthmus of Corinth. Barrès, visiting Mistra in the 1890s, speaks of graves in churches at Mistra freshly opened, of the mounds of skulls and tibias. When Buchon wrote in 1841 about the armor found in Halkis, he said that some of it went missing while it was on the way to Athens, and that pieces were available for sale in Halkis. 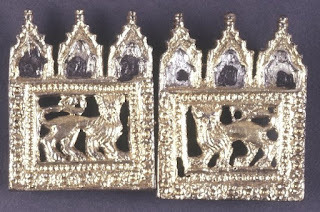 The question of sources and agency for the Halkis Treasure cannot really be discussed until the Lampros papers are examined. I hope that someone -- or several people -- will want to pursue this further. Again, I am glad to make my material available. Halkis treasure numbers run CDEF.F103, CDEF.F376-F396. Particular thanks to Nicky Tsourgarakis who obtained the Lampros letters for me and retranslated sections of them. The Lampros letters are found in: Ashmolean Archives, Fortnum Papers, F/9/i/1-14. The English translation in the Ashmolean is by Bet McCleod and Nicoletta Norman. We should be calling this Negroponte Hoard the 'Halkis Treasure' and I will try to do so. I have written about it twice before, generally here, and about a specific emblem here. I am speaking today -- January 6 -- to the American Institute of Archaeology about the treasure, as part of a panel on the relationships of museums to archaeology. This is some of what I will be telling them, although they will see many more pictures than I have put here. 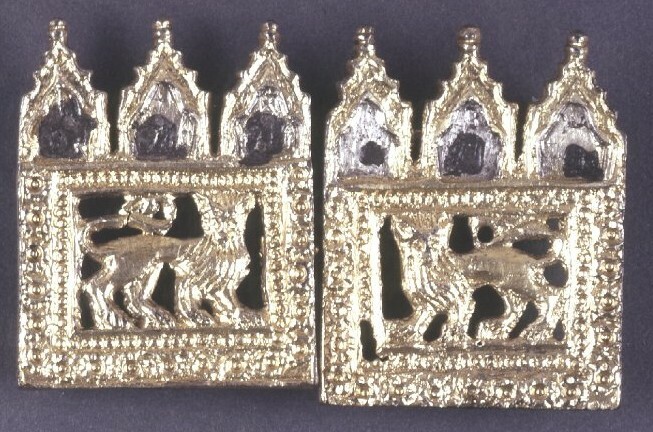 The known documentary sources for the treasure are extremely limited and consist of fourteen letters in Italian (with modern English translations) in the archives of the Ashmolean Museum at Oxford. The letters were written by Pavlos Lampros between November 1867 and December 1872. He was a well-known Athenian antiquarian and numismatist , father of the great historian (and Prime Minister) Spyridon Lampros, and his coin collection is the core of the Numismatic Museum in Athens. It is possible that there are more documents in the Lampros papers in the Numismatic Museum: no one has yet looked at these, and I would encourage a student looking for a dissertation topic to consider them. For various reasons, I cannot rely on plans for further work on this topic, and I would be glad to send my accumulation of material and photographs to a serious scholar. The fourteen Lampros letters at the Ashmolean are to Charles Drury Fortnum, a wealthy and deeply knowledgeable antiquarian scholar and collector, who bought for several collectors and collections, including those of the Ashmolean, the Victoria and Albert, and the British museums. The 417 pieces that collectively make up the Halkis Treasure are now in the Ashmolean -- 21 rings and a spectacular button, and the BM -- 395 items, mostly buttons. (Every button -- 65 in one group, 40, 36, 42 in other groups -- gets its own catalog entry.) Most of these pieces are of Western medieval or Byzantine style, a few earrings and other odd pieces are classical and Hellenistic. Almost all are gold, silver, or gilded silver. Mr. Fortnum only wanted the best. The letters primarily list items Lampros has for sale, negotiates prices, and tells how items are being transmitted, and names agents to receive payment. 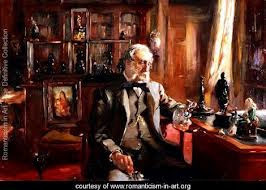 In 1867, when the correspondence began, Fortnum had become an advisor to the British Museum where his good friend Augustus Wollaston Franks was Keeper of British and Medaeival Antiquities and Ethnography. 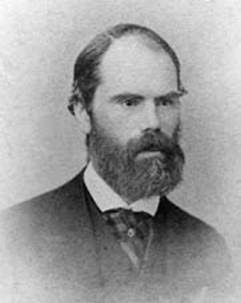 He turned down the position of Principal Librarian (director) in 1878. 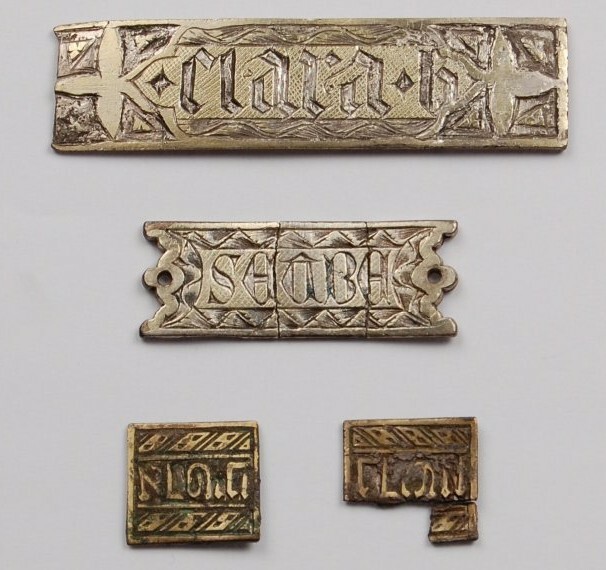 Items from the Halkis Treasure in the BM collection can be identified in the letters, as well as items in the Ashmolean. Franks bought these items personally, with his own funds, and bequeathed them along with 20,000 other items to the BM at his death in 1897. Nowadays, this blurring of curators, collectors, and collections would be frowned-upon, at a minimum, but I know nothing of museum financing in England in the 19th century, and these men made possible extraordinary collections. I ask you not to let anyone know that I provided you with these objects, as this could compromise my position. I am prohibited from exporting antique objects. Whatever the Greek law on antiquities in 1867, it covered the rings and buttons in the Ashmolean and BM collections. The letters also indicate that Lampros used a number of sources to transmit the items to Franks, and several agents to receive and transmit money back to Athens. I can tell you precisely that all the objects that you first bought, and those that I now possess, were found in the foundations of one house alone situated within the fortress of Halkis. I believe that [they] were treasure belonging to some medieval prince. This is not likely to be completely true. This statement seems to hark back to the find in 1840 of the Chalkis Armor, a large store of 15th-century armor, divided between the National Museum of Athens and the Metropolitan Museum of Art. The armor was allegedly found bricked up in a wall next to the military hospital, but the exact circumstances of the find are not now known. But the topos of a single-find-in-Halkis was firmly set in the minds of European collectors. The single-find topos is also firmly set in modern consciousness. 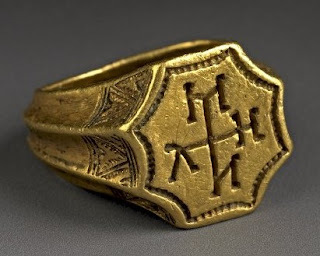 The on-line Ashmolean catalog of rings from the Halkis Treasure states that they were found in Halkis in 1840. In a variant on the single-find, in January 2009, the Gennadius in Athens gave a presentation on the Halkis Treasure. All three speakers -- an Ephor, a Library Director, a BM Curator -- chose as their default position the statement that the treasure was a hoard from the fall of Negroponte to the Ottomans in 1470. This is extremely unlikely, even impossible, if one has read the original sources pertaining to the defense and siege of Negroponte, and suggests to me something like a whiff of chauvinism. 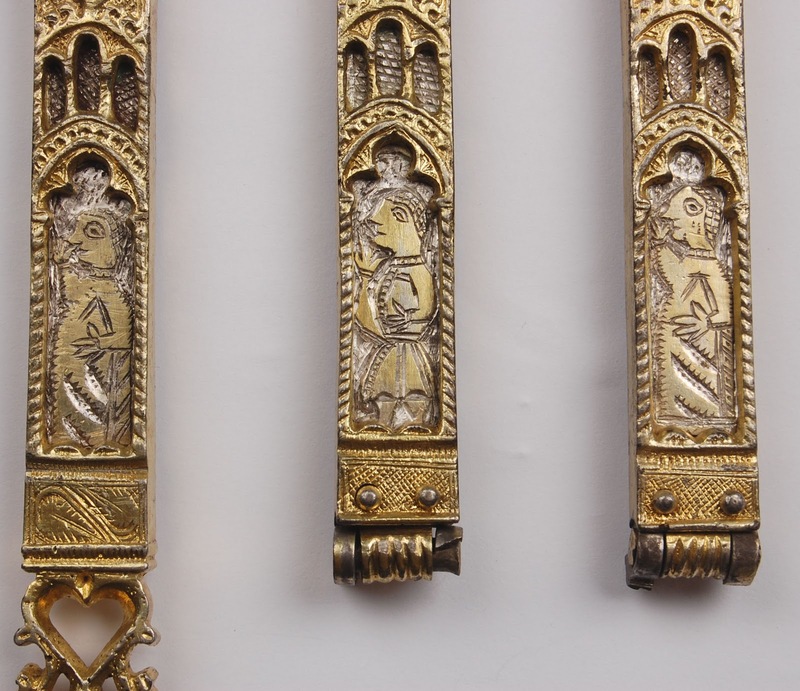 The Curator has wavered since, concluding a 2010 article, "It is clear that the Treasure comprises object from different hoards and different dates, but how and when these came together remains a mystery." Although she and her editor did not seem to notice that she had written on the first page, "it has to be assumed that the deposit of the Chalcis Treasure was made in 1470 when Chalcis was invaded by the Ottoman Turks." 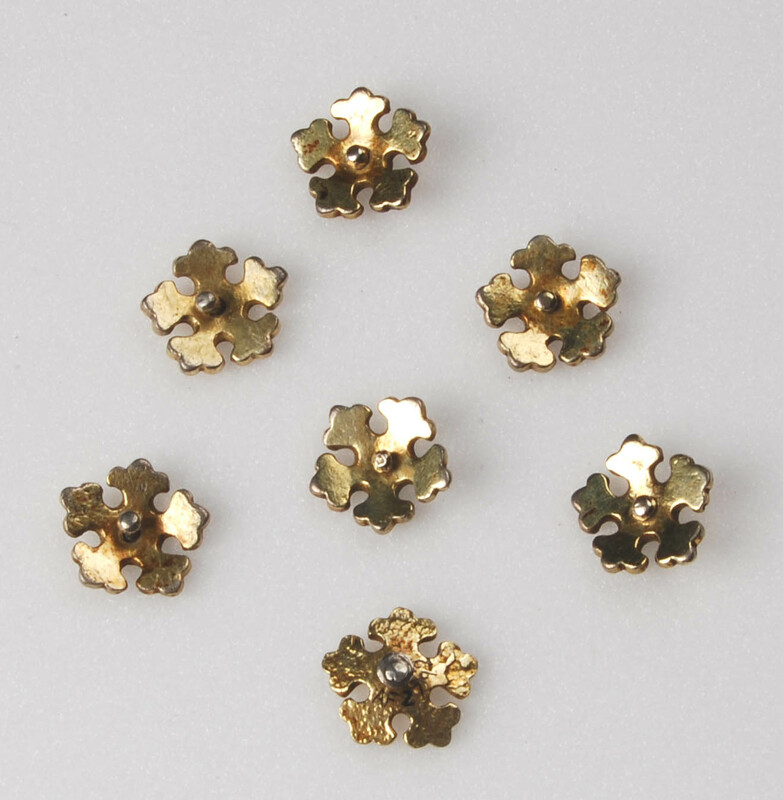 The Lampros letters do not say when various finds were made, although one has a strong impression that they are ongoing during the period of the letters. The most reliable information we can get from the letters is that certain items were being sold between 1867 and 1872. Particular thanks to Nicky Tsougarakis who obtained the Lampros letters for me and retranslated sections of them. The Lampros letters are found in: Ashmolean Archives, Fortnum Papers, F/9/i/1-14. The English translation in the Ashmolean is by Bet McCleod and Nicoletta Norman.